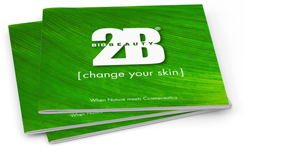 Unlike other peels which only work on the surface, 2B Bio Peeling activates the exfoliation process from within. Just like our organism expels any foreign body, the powerful agents, which are 100% natural, stimulate our skin to reject the dead cells that smother it. For men and women from the age of thirty onwards to prevent cutaneous ageing and retain a radiant complexion. A one month treatment consisting in a weekly session, ideally performed twice a year. Your skin is purified in depth, your cellular metabolism reactivated, wrinkles and fine lines are bolstered from within, dilated pores are tightened, and pigmentation stains are erased. This is an immediate beauty flash treatment. Only the respect of the care protocol involves the responsibility of the brand. Thanks to its innovative exfoliating principle, this treatment privileges the elimination of blackheads, acne spots and helps in regulating the sebum excess. The natural and powerful agents of this treatment stimulate the skin to reject the impurities that smother it. For teenagers, men and women of all age, for the face and the body. As a cure of 4 treament sessions according to the troubles, at a rate of one treatment every 7 to 10 days. 2 cures a year is recommended. The skin is deeply purified. Free of all blackheads and inflammation, the skin is more smooth and bright. This treatment increases the already lightening effect of our 2B Bio Peeling. This care / product concept enables to combat pigmentary disorders while providing essential hydration for comfort. The original mode of action of this treatment provides the skin with an exclusive lightening effect that will help in decreasing the hyperpigmentation of the skin and unsightly spots that spoil the look of the epidermis. Multi-ethnic, this treatment is dedicated to all kind and colors of skins. As a 2 months cure, at a rate of one treatment every 2 weeks. The effectiveness of this concept will give a brighter and homogenous complexion (reduction of melanin spots,lightening effect, reduction of hyperpigmention stains) and make the skin visibly younger. Hydrating care acts essentially on comfort. 2B Bio Beauty increases the level of oxygen in the horny lay. Formulated with highly concentrated active agents of an exceptional quality, this treatment enables your skin to breathe optimally and to better self-regulate in a polluted environment. It also acts as a detoxifying treatment. For very dry skins: the best preventive treatment. For mature skins: it slows down the forming of free radicals. It lessens the damaging effects of time with visibly reduced wrinkles. As beauty flash treatment or as a 2 months cure at a rate of one treatment every 2 weeks. Your skin, enriched in oxygen, recovers its youthful radiance. Incredibly soft, it becomes more resistant and firmer. Thanks to its innovative actives, the enzymatic care softly exfolitates the epidermis and cleans up the skin. Lightening and dermo-purifying, the care nourrishes and protects the skin against harmful effects of the pollution. For teenagers, men and women at any age; for the face and the body. Perfectly purified and protected, the skin breathes. Brighter and even, the complexion is shining. The compliance with the protocol only involves the brand liability.